The Synchronous Optical Network (SONET) is one of ANSI standardized multiplexing technology for synchronous data streaming and is designed for data rates of 51.84 Mbit/s up to 2.5 Gbit/s. Synchronous Optical Network was developed by U.S. Bell Labs. Synchronous Optical Network is based on the older ITU standardized Synchronous Digital Hierarchy (SDH), the specifications of SONET and SDH are small deviations in the header and offer the same speeds. Therefore Synchronous Optical Network and Synchronous Digital Hierarchy are compatible to working multiplexer. The decision of Synchronous Optical Network building was taken by the ECSA (Exchange Carriers Standards Association) in the United States to allow connection of standard fiber optic systems to connect each other, although they were from different manufacturers. In the later stages of development of Synchronous Optical Network, CCITT (Consultative Committee International Telephone and Telegraph) also entered; predecessor of the current ITU-T, the ITU (International Telecommunication Union, Telecommunication Standardization Sector) so that they could develop a standard that would enable the interconnection by fiber telephone networks worldwide. Part of this stage of development is called Synchronous Digital Hierarchy, popularly known as SDH (Synchronous Digital Hierarchy). In the late 90s, it was estimated that the standard Synchronous Optical Network and SDH infrastructure will provide transport for the global telecommunications network for the next two or three decades. Even when points of compatibility with the Synchronous Optical Network standard is applied practically only in the USA and Canada while SDH applies in the rest of the world. Synchronous Optical Network defines a technology for carrying many signals of different capacities through a synchronous optical hierarchy which is flexible. This is achieved by an interpolation scheme of multiplexing bytes. Bytes interpolation simplifies multiplexing and provides a network management end to end. The first step in the process of Synchronous Optical Network multiplexing is generating the signals of lower level of multiplexing structure. The basic Synchronous Optical Network signal which is known as signal level 1 consists of a set of 810 bytes divided into 9 rows of 90 bytes. This set is transmitted every 125 microseconds, corresponding to the basic telephone channel’s rate of 64 Kbps , so that the bit rate of the STS-1 signal is 51.84 Mbps. The highest level signals are formed by the multiplexing of various signals of level 1 (STS-1), creating a family of STS-N signals where N denotes the number of signals that compose level 1. The increased configuration flexibility and bandwidth availability of Synchronous Optical Network provides significant advantages over other oldest telecommunication systems. Reduction of multiplexing equipment for the extraction-insertion and traffic at intermediate points. Improved reliability of the network as a result of the lower number of computers involved in the connections. Provides byte header that facilitate the management of bytes of information and maintenance of the equipment itself. Defining a synchronous multiplexing format for carrying digital signals (PDH), at various levels (as DS-1, DS-3) and a synchronous structure greatly simplifies the interface of digital switches and as connectors and multiplexers. The existence of a wide range of generic standards allowing interconnection of different manufacturers’ products. The definition of a flexible architecture capable of accommodating future applications, with a wide range of transmission speeds. Synchronous Optical Network provides a centralized interface, as an integrated remote transport and multiplexing equipment. Monitored end to end performance. Support for newer high-speed services. 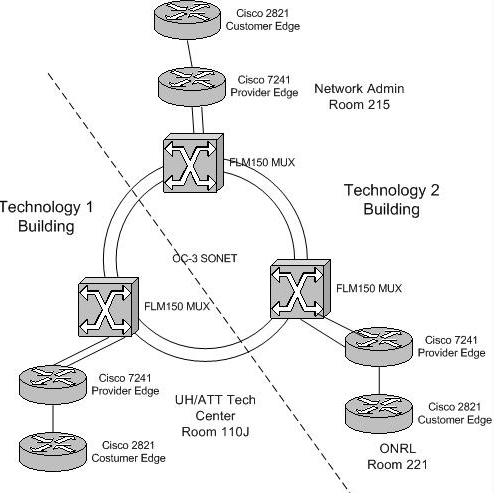 The ability to create distributed network structures very cheaply through multiplexers. Double ring structure provides immunity to failures. This Article Has Been Shared 3385 Times! Cite this article as: Abhishek Ghosh, "Synchronous Optical Network," in The Customize Windows, December 29, 2012, April 26, 2019, https://thecustomizewindows.com/2012/12/synchronous-optical-network/.